It was one wild ride. You don’t know the definition of “brisk” until you have taken a swift ride aboard a Coast Guard zodiac in the open ocean at 40 knots. They give you survival suits and helmets with face masks for a good reason. You don’t even want to hear the word “rain” as you hunker down with the wind whistling past your face. 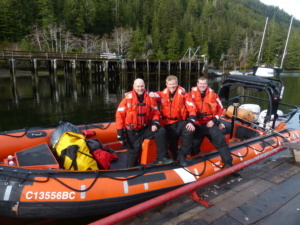 The Canadian Coast Guard has been involved with the W2R Project for some time, providing transportation for previous Lt. Governor Steven Point and current Lt Governor Judith Guichon to remote aboriginal settlements along the coast. 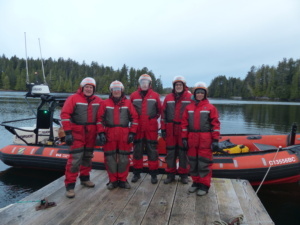 On a recent W2R team visit to Kyquot, which requires a water taxi between the village and Fair Harbour, the Coast Guard vessel Tanu under the supervision of Captain Bill Bennet was in attendance doing search and rescue training. Several of the ship’s crew offered the W2R team a ride back to Fair Harbour. Along the way the W2R team was offered a quick visit onboard the Tanu and to meet the 15-member crew. Search and Rescue is an important aspect of the member’s work. 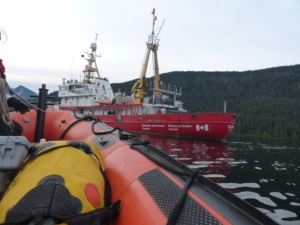 The Tanu maintains close relationships with First Nations along the coast. Often the First Nations communities are the first to react to a sinking or other emergency. When a whale watching vessel sank off Tofino, it was the First Nations skippers who responded first. 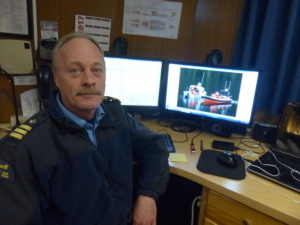 When the BC Ferries Queen of the North sank near Hartley Bay, it was local villagers who were first on the scene. The Coast Guard joins the RCMP, BC Ferries, Britco Structures, Telus, Bandstra, Rotary District 5040, Windsor Plywood, Nanaimo Correctional Centre and numerous small businesses as a member of the Write to Read team.